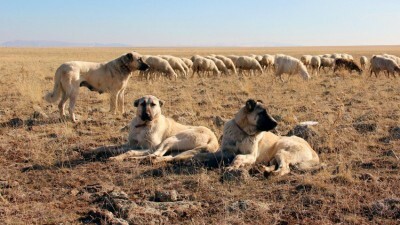 The huge, sand-colored breed is named after a town in the southern Sivas province, where Kangals emerged as a distinct breed about 6,000 years ago. Kangals can grow to about 145 pounds and up to 33 inches tall, surpassing most other massive dog breeds like Great Danes. Today, in Turkey and increasingly in the United States, the viciously protective dogs are known and celebrated as wolf fighters. The dogs boast an intimidating size, a thick coat that protects against bites, and fearlessness—they’re capable of killing a wolf but sometimes the sight of a Kangal alone is enough to scare large predators away. The shepherds whistle and shout all the time at the sheep, directing them this way and that, but it’s not common for the Kangals to face anywhere in the direction of the flock. Their heads are always pointed towards the horizon or the nearest hillside; they are always on watch. When we load into an SUV at the end of a bitterly cold day, they’re still looking out into the distance with no desire to turn in. Another great dog to use to guard herding dogs and sheep or goats is the Presta Carnario (or Canary Dog). In the North West various crops have required burning of stubble to ensure good crops, e.g. Blue Grass. Environmental regulations prevent burning more and more. In recent years farmers contract with traveling goat herders that bring about 200 goats to a stubble field and clear the field in a few days. A hand full of herding dogs, under the control of a few herders, control the goats as they eat their way down to almost bare earth. One Presta Carnaro roams the herd on guard, the protector. This is not as cheap as burning but apparently as effective.